Welcome to India, You will be received by Premium India Tour representative at airport and assisted to your hotel. Continue drive to Kovalam and check into beach resort. Rest of the day is at leisure. Overnight at Hotel. After breakfast at hotel. Drive to Kanyakumari for excursion tour. It is 86km from Trivandram. The land of ‘Sangam’ (convergence) of the three oceans - Bay of Bengal, the Arabian Sea and the Indian Ocean, Kanyakumari, is the southernmost point of peninsular India and has been enticing tourists due to its geographical positioning. A picturesque sight of sunrise and sunset, long stretches of sand of many hues accentuate the city’s serene and astonishing natural environment. Kanyakumari is also a popular pilgrimage destination for Hindus. Enjoy sightseeing tour by visiting Kumariamman Temple, Vivekananda Rock, Gandhi Memorial, Guganathaswamy Temple, Udyagiri Fort, Nagaraja Temple, Padmanabha puram Palace. Overnight at Hotel. Morning at leisure. Later drive Trivandrum for sightseeing tour of Trivandrum the capital of the State of Kerala and a beautiful seaside city. Here visit the ancient temple of Sri Padmanabhaswamy, dedicated to Lord Vishnu, the presiding deity of the town, the Sri Chitra Art Gallery and other local sights. Rest of the time at leisure. Overnight at Hotel. In the morning drive to the Quilon to board a "Kettuvallam", the traditional Kerala House Boat. 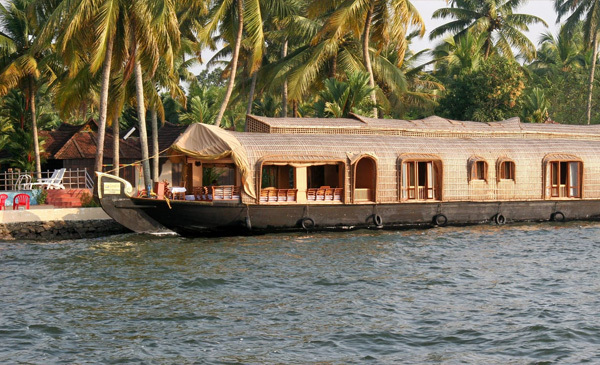 Embark on a cruise on the scenic backwaters. The still lagoon will welcome you with palm trees lining on the shore. Watching the daily activity of the villagers will enrich your curiosity. The Chinese Fishing Nets set in the shore, and fishermen gliding slowly on the water, bunch of ducks swimming nearby the bank, birds chirping in the sky - all together presents a very pleasant picturesque worth to mesmerize you. You will stick to the deck watching the splendid scenery of backwater and taking sun bath. As you take your lunch. In the evening, you will visit the paddy fields. It will give you better insight of the village life of Kerala as you will have opportunity to interact with the local villagers and will know well their daily activities. Overnight at Housebaot. A drive to Kumarakom. Perched sleepily on the eastern banks of the mighty Lake Vembanad in the heartland of Kerala’s famed backwaters, Kumarakom has changed little since the Middle Ages but for it’s string of exotic resorts, making it the perfect point to explore the backwaters. Although right in the thick of a tangle of lush tropical waterways, Kumarakom is technically an island on Lake Vembanad. This is an ideal place to chill-out for a few days. There is also a wonderful bird sanctuary, winter home to many migratory birds which is worth a visit. Overnight at Hotel. .
A short drive to Periyar, South India’s most popular wildlife sanctuary and home to bison, antelopes, sambar, wild boar, birds and even the odd tiger! Kumli, close to the sanctuary and where you’ll stay, is a pretty little town dotted with small spice and handicraft shops. There is plenty to do in and around Periyar, so we leave the choice to you. Enjoy an included boat ride on Lake Periyar to spot herds of wild elephants or visit the lush nearby tea estates. Overnight at Hotel. Morning at leisure. Drive to Kovalam. Spent rest of the day on the beach side of Kovalam. Overnight at Hotel. Breakfast at Hotel, in time transfer to airport for your flight back to home.